It was a tale of two political parties in Minnesota on Wednesday: resurgent Democrats who tightened their grip on the governor’s office and two U.S. Senate seats in Tuesday’s election, and wincing Republicans shut out of statewide contests for a 12th straight year and swept out of power in the Minnesota House. Democrats cruised to easy victories up and down the ballot, as Tim Walz won an open governor’s race by more than 11 percentage points over Republican Jeff Johnson. U.S. Sen Tina Smith won voters’ approval to finish former Sen. Al Franken’s term by a similar margin. After fears that he would lose a race for attorney general marred by allegations that he once physically abused an ex-girlfriend and his opponent’s controversial legal career, Keith Ellison won the race by nearly 4 percentage points. Behind each election lies a troubling and familiar trend for Republicans: They keep losing ground in Minnesota’s metropolitan core and surrounding suburbs. Former Gov. Tim Pawlenty stitched together the party’s last statewide victory in 2006 by holding pace in the state’s population centers, with 47 percent of the vote in Minnesota’s seven-county metropolitan area, while winning over rural voters. But the GOP’s share of the urban and suburban vote has steadily slipped. Johnson lost to outgoing Democratic Gov. Mark Dayton in 2014 thanks largely to a 133,000-vote edge in the metro. On Tuesday night, Walz beat Johnson in the same seven counties of Hennepin, Ramsey, Anoka, Washington, Dakota, Carver and Scott by 372,000 votes. “The suburbs were a massacre,” former Republican House Minority Leader Marty Seifert said. “The pathway to victory is going to have to be cobbling together a coalition … that runs through the suburbs into rural Minnesota. You can’t have one or the other — you’ve got to have both. “We’re going to have to do some soul searching,” he added. The state’s record-breaking turnout — nearly 2.6 million voters cast ballots in Minnesota in the midterm election, according to the secretary of state’s office — was centered in that region. And there were other factors at play that helped Democrats keep Republicans off the board for a fifth consecutive election. Sen. Amy Klobuchar, a popular Democrat who easily clinched a third term against a little-known opponent with 60 percent of the vote, helped other Democrats on the ballot. Both parties concede a backlash against President Trump and his party was a factor — Minnesota is no stranger to midterm swings. 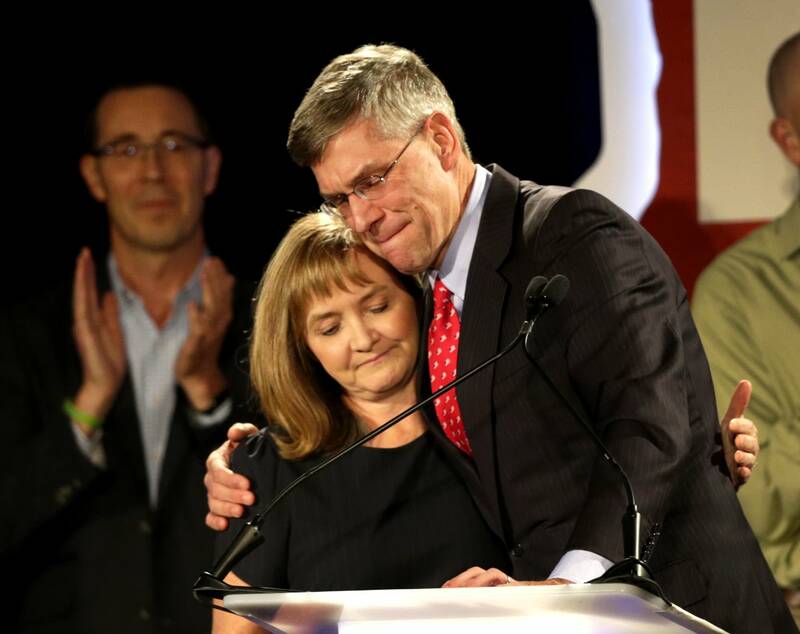 But even in strong years for Republicans nationwide like midterm elections during former President Barack Obama’s administration, statewide GOP candidates have been unable to break through in Minnesota. And the effects of Democrats’ strong night at the top of the ticket spilled down ballot. Democratic House Minority Leader Melissa Hortman credited a combination of strong candidates and top-of-ticket help — including from two Democratic candidates who easily unseated incumbent Republican Reps. Erik Paulsen and Jason Lewis in the suburbs — with Democrats’ takeover of the House. Democrats won 17 GOP-held districts to retake the majority — all but one in the Minneapolis-area suburbs. An 18th potential flip of a Bemidji House seat will be subject to a state-funded recount — former Democratic Rep. John Persell won back his district by just eight votes, according to unofficial results. “The Republican Party leadership of right now is out of touch with urban and suburban voters. I don’t think that they’re getting these voters back unless they change what their party is about,” said Hortman, adding that Democratic suburban candidates put new gun restrictions, abortion access and public school funding at the heart of their campaigns. It wasn’t all bad news for Republicans. The party clung to its one-seat majority in the state Senate with a special election win in a heavily conservative central Minnesota district. Former Sen. Michelle Fischbach’s departure in May to be sworn in as lieutenant governor triggered an all-out brawl for the Senate majority, but GOP Rep. Jeff Howe easily won that seat. And at the federal level, Republicans flipped two open congressional districts now held by Democrats. Local county commissioner Pete Stauber handily won northeastern Minnesota’s 8th Congressional District. Republican Jim Hagedorn broke through on his fourth try in Minnesota’s 1st Congressional District, defeating Democrat Dan Feehan by a razor-thin margin.